Now don’t flip out, guys, but when I was younger, I didn’t really like Cinnabon cinnamon rolls all that much. Sure, I would eat one if my parents’ bought a four pack from the mall after a long day of shopping, but it just wasn’t my favorite. Even though I have always been a huge fan of cinnamon, those rolls just didn’t appeal to me. And if I had a choice between a cinnamon roll or cookie, I always picked the latter. Stop shaking your head now, because guess what? I finally discovered my love of cinnamon rolls years later. I’m just a teeny tiny bit late to jump on the bandwagon, but I do love those ooey gooey treats. And while I never buy Cinnabon rolls just for myself, I will gladly eat one if offered to me. But up until now, I didn’t discover a true cinnamon roll. You know, the home-made kind, with thick frosting, a warm center, and cinnamon-y goodness oozing out of it. Sure, Cinnabon rolls are good for the store-bought kind, but the ones that you make in your own kitchen are even better. They really are! And I can prove it to you with these Overnight Cinnamon Rolls with Cream Cheese Frosting. I was in the mood for some home-made cinnamon rolls last weekend. The kind that takes some prep work and sits overnight. Do you get into kicks like that? I’m all about whipping up easy treats (that’s mainly what my blog focuses on), but once in a while, you just gotta make those time-consuming dishes that are totally worth the effort. And because the hubster and I whipped up those canned cinnamon rolls that you just pop into the oven several days before, my cinnamon cravings weren’t quite satisfied. 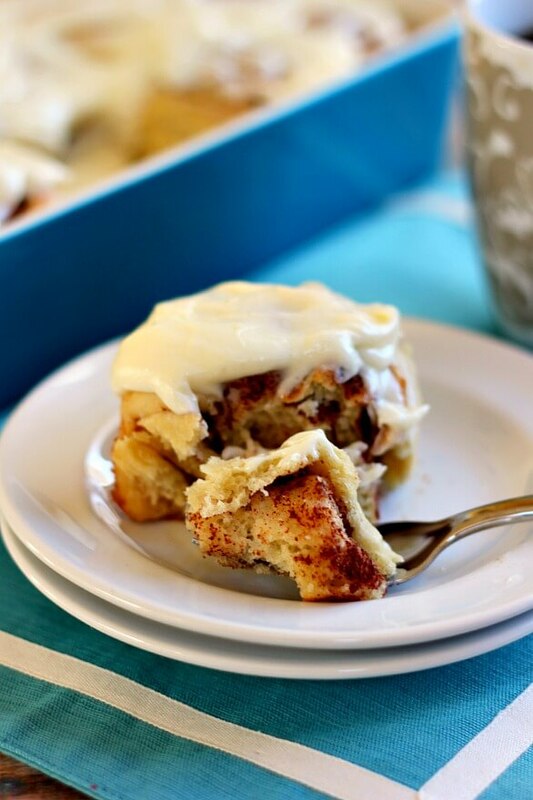 Enter in these Overnight Cinnamon Rolls with cream cheese frosting. They’re soft, fluffy, and bursting with just the right amount of cinnamon. 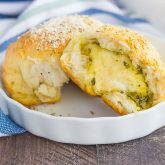 These rolls are made the night before and then put in the oven to bake in the morning, resulting in a sweet roll, oozing with flavor and cream cheese frosting. After all, that’s a requirement for cinnamon rolls, right? And while these Overnight Cinnamon Rolls do take a little bit of preparation, it’s definitely worth it, friends! After the dough is made, it requires at least an hour and a half of rising time. Then comes the fun part: rolling and sprinkling! Most recipes call for the dough to be rolled into a rectangle, but mine was more of an oblong shape. If you can roll the dough into a rectangle, you get bonus points! After the rolling, slather on a stick of butter (I didn’t say this recipe was healthy, did I?) and sprinkle some cinnamon and sugar on top. Starting with the long end, roll the dough tightly. Using a serrated knife, cut into twelve rolls and place into a lightly greased 9×13 baking pan. Then pop it into the refrigerator overnight! 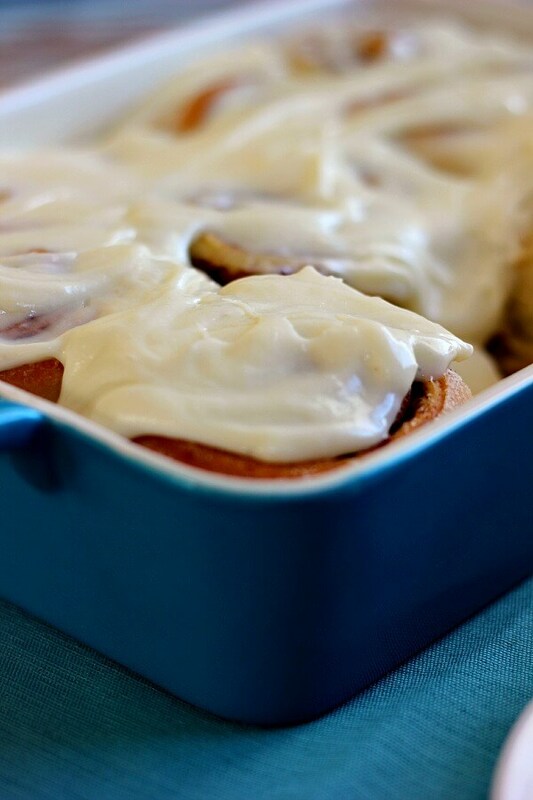 When you wake up in the morning, these Overnight Cinnamon Rolls are almost ready to be baked. It’s important to take them out of the refrigerator and let rest in a warm spot for about a half hour so that they can rise slightly. Once the rolls are ready, place them in the oven to bake for about 25 minutes. As the cinnamon rolls are working their magic, prepare the delectable cream cheese frosting. And I won’t tell if you sneak a spoonful or two of that delicious spread! Once these cinnamon rolls come out of the oven, prepare to be amazed. Move over Cinnabon, there’s a new roll in town! Buttery, full of sweet cinnamon and sugar, and slathered with cream cheese frosting, these cinnamon rolls will be your new favorite breakfast, guaranteed! These Overnight Cinnamon Rolls are soft, fluffy, and bursting with just the right amount of cinnamon. In a large bowl, combine yeast and warm water. Stir to dissolve. Add milk to yeast and combine. Add in sugar and egg, mixing thoroughly. Gradually stir in 1 cup of flour and mix well. Pour in melted butter and salt and combine by hand. Add in rest of flour (2 1/2 cups) and combine by hand until dough forms a large bowl and pulls away from sides of bowl. Cover the dough and let rise for about an hour. Once dough as doubled in size, lightly flour a working surface. Turn dough out and knead several times, adding flour to top and bottom of dough to ensure that it doesn't stick, if needed. Roll dough out to be about 1/4 inch thick, into a large rectangle or oblong shape. Spread the softened butter all over dough, coming right to edges. Sprinkle cinnamon and sugar over top of butter. Using the long edge, roll dough all the way up. Using a serrated or other sharp knife, cut dough into twelve pieces. Place into a lightly greased 9x13 baking pan with swirl side up. Cover and refrigerate overnight (or at least 8 hours). In the morning, remove rolls from refridgerator and uncover. Let rest for about about 45 minutes in a warm place. Preheat oven to 350F. Bake cinnamon rolls for 20-25 minutes, or until tops are golden brown. Remove from oven and frost with cream cheese frosting. While cinnamon rolls are baking, cream together butter and cream cheese with an electric mixer or stand mixer with fitted paddle attachment. Once everything is combined, beat in heavy cream and mix until smooth. Frost cinnamon rolls once done baking. Lightly adapted from Taste of Home . Thanks, Mir! The frosting was my downfall, so darn good I just kept sneaking spoonfuls of it! I could actually eat that whole pan right now. Cinnamon desserts are my favourite and this looks so moist and creamy. Email me one? Haha. Haha I wish I could, Dannii! Happy Friday Gayle! Cinnamon rolls are my favorite, except when I was younger at the mall, I chose the cookie AND the cinnamon roll. (Can you guess I was a slightly chunky kid). 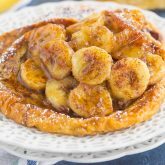 These look fabulous, something special I could do a bit ahead of the time for the family for a little old dessert for breakfast. And the smell wafting out of the kitchen........whoa. Happy Friday to you too, Laura! Thanks so much for the kind words! These take a little bit of work but are definitely worth it! These rolls are perfect, Gayle. I never ate them much as a kid either. I always preferred ice cream over thick heavy rolls. And I still do prefer something on the lighter side but once in a while a nice warm gooey roll is purely heaven. Thanks, Jen! I couldn't eat these all the time, but they do hit that sweet spot every once in a while, especially with this frosting! I love these overnight rolls for the exact same reason, Sarah! So nice to be able to just pop these babies in the oven. Thanks so much for the cinnamon roll love, friend! Ummmm this is happening this weekend!! Cinnabon's got nothing on these rolls! :) Thanks, Kelly! These looks sooo good. I really need to learn how to get along with yeast. The frosting! GAH!!! It looks so lush! Yum. Thanks, Sarah! I was a little hesitant with yeast, but these were super easy to make! Next to brownies, cinnamon rolls are probably my favorite dessert. And even with that I'm so with you-- I would never buy a cinnabun. But would I gladly eat one if handed to me? Heck yeah! The real question is though, would I eat the whole pan if your homemade buns were handed to me. The answer is a resounding yes. I had to force myself not to eat these all in one sitting! Especially with this frosting, oh man...it's delish! Thanks, Sarah! Well sounds like you have a lot of lost cinnamon roll time to make up for. So get eating! These look delicious! I do, Liz! :) Thanks for the cinnamon roll love, friend! Cinnamon rolls are the best treat! I love that they can be prepped the night before too. Happy Friday, Gayle! Thanks, Ashley! Happy Friday to you, too! I've never been a huge fan of Cinnabon either. Homemade is the only way to go and these look perfect. Good morning me! I agree, nothing beats a homemade roll. Thanks, Tori! What a wonderful way to wake up in the morning! I love cinnamon rolls, but I'm not a fan of frosting on them. I always make a few without for me and the rest are frosted for the family! The smell of cinnamon is such a great thing to wake up too! I'm not a big fan of frosting either, but I do love the cream cheese kind. Thanks so much for the kind words and for stopping by, Kathy! Thanks, Annie! I'm sure your husband would love these! Oooh, I love a good cinnamon roll recipe! These look really sweet and delicious! Thank you, Kelly! These are my new favorite roll! Thanks so much for the sweet comments, friend! This was surprisingly easy to make and so good! Haha, it didn't take me nearly as long to discover my love for cinnamon rolls! But I'll forgive you, because these look amazing! Just this week I was at the mall, and the smell of Cinnabon was so enticing! These look amazing, just like Cinnabon! And I love that these are overnight. If I had these waiting for me to bake in the morning, I would spring out of bed first thing! I have to admit that Cinnabon does smell crazy-good at the malls! Thanks so much for the kind words, friend! Ahhh ... I just love that you can make these the night before and have them ready to go the next morning. They would be great to make when inviting friends or family over, wouldn't they? Really happy you've discovered your love of Cinnamon rolls. Personally, I think the smell of them is unbeatable .... mmmm. Oh, Gayle, you're teasing me with this post! This would be perfect for when you have people coming over, Helen! And I agree, the smell of cinnamon rolls is heavenly! Thanks, Helen! I love overnight rolls...who wouldn't like cinnamon rolls for breakfast! that frosting is making my mouth water Gayle..yum yum! Pinned. Thanks so much, Manali! The frosting is the perfect touch! 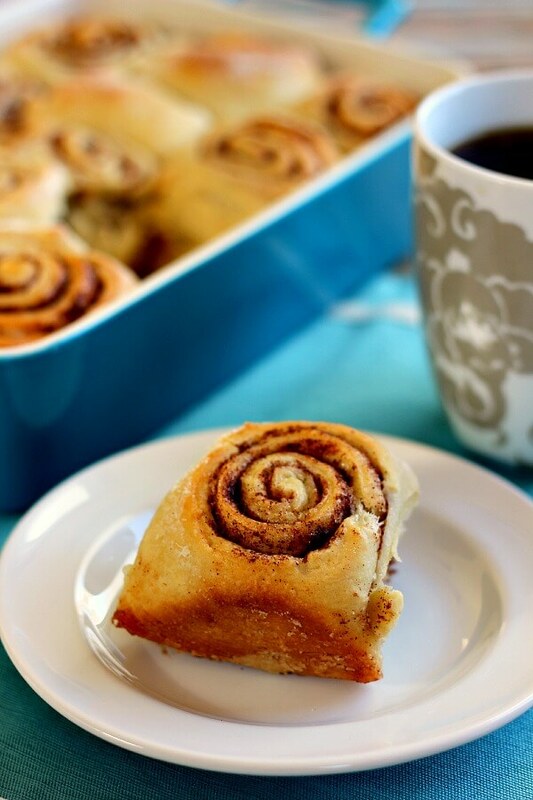 Gayle, we forgive you for not liking Cinnabon cinnamon rolls when you were younger :P you made up for it big time by sharing this recipe. . whoa, these overnight-cinnamon-rolls are fabulous! So glad you rediscovered cinnamon rolls. I have had an obsession for cinnamon rolls for as long as I can remember. These look great for Sunday morning I will have to give them a try. These are such a good breakfast for the weekend, Kelley! Thanks! 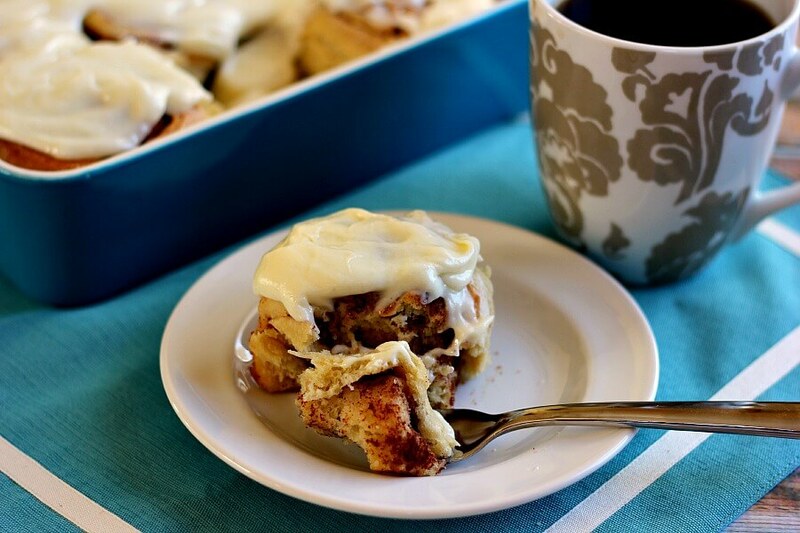 Cinnamon rolls that take a little time are definitely where it's at! So much better than cinnabon! These look perfect Gayle! I did used to love those cinnabon rolls from the mall, haha! I think the frosting and the middle was my favorite part! I've never tried to make my own though and I think I need to! I was just thinking about how I have nothing good to eat for breakfast tomorrow morning and now I was wishing I had the energy to whip these up! I love the middle of cinnamon rolls, too! These make a great breakfast for the weekends, Izzy! Thanks for the kind words! I don't think life could get any better with cinnamon rolls for breakfast. 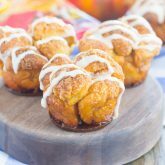 These look perfect and delicious Gayle - and of course, I LOVE how they are overnight! Thanks, Thalia! I love that they can be prepped the night before, too. Whoa pass a girl the pan! I'm a die hard cinnamon roll fan and these pass every requirement and then some. THAT FROSTING THO. Overnight perfection right here! This frosting is amazing! Thanks, Mary Frances! Cinnamon rolls look so scrumptious, Gayle! I always love the fact that you get up and breakfast is all ready! worth the effort! thanks for sharing! Thanks, Tash! My ads are through The Blogger Network, though I do have BlogHer on my site, as well as a few other random ones. Have a great weekend! Homemade ones are definitely the way to go! Thanks, Nora! Love that thick cream cheese frosting on top! Your rolls look so perfectly formed. Whenever I make cinnamon rolls, they just look like blobs of dough. Thanks, Christin! I was impressed with how good my rolling skills turned out with these! Oh how I love cinnamon rolls!! My mom used to make the ones from the can as a special treat breakfast for us when we were kids - we loved it! These look awesomeeeee. Thanks so much, Andrea! Homemade is definitely the way to go! What beautiful rolls! Homemade is always better than Cinnabon so I totally get you! Thanks, Aimee! 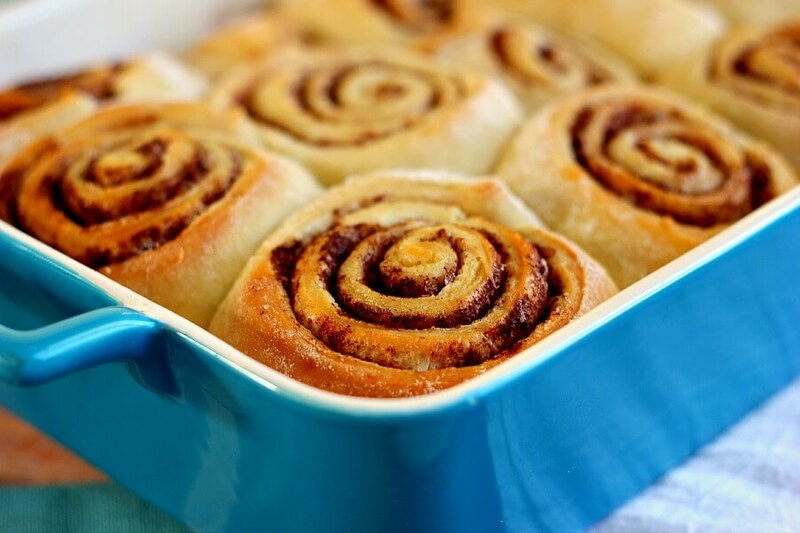 These rolls definitely rival Cinnabon's! Cinnamon rolls are the BEST!! I definitely chowed a few Cinnabons at the mall with my friends in high school HAHA! Yours look so much better though and I bet they made your house smell AMAZING!! Thanks, Jess! My house smelled wonderful when these babies were baking! These cinammon rolls look so perfect!! I know what you mean about the mall cinnamon rolls - I find they smell better than they taste :) Nothing beats delicious homemade cinnamon buns like these! Yum! I definitely agree, Ceara! 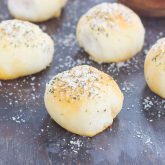 These homemade rolls definitely taste as good as they smell. Thanks for the kind words, friend! Whhhaaaat?!? You didn't like cinnamon rolls that much!? That smell that they pump all over the mall didn't call you like a siren?! Well for coming so late to the party, you sure whipped up an impressive batch of cinnamon rolls! They look perfect! Right now to the icing! Haha maybe I should correct myself, I do love the smell, but I could live without them! :) Thanks so much for the kind words, friend! Gayle I love cinnamon rolls and doesn't these kind of overnight breakfasts make mornings way easier?! Loving these and that thick icing!